The recently finished elections in Montenegro showed that the last European dictator does not hesitate to keep ahold of his power by any means necessary. The history of Milo Djukanovic’s rule shows that this is a man who is ready to do anything for the sake of personal interests. He has no ethical boundaries. That Milo Djukanovic considers Montenegro to be his personal fief is best illustrated by his current ideology. Milo Djukanovic publicly speaks that his aim is for Montenegro to emerge from its own cultural – historical circle. This single man, who lived modestly until his arrival in power, has decided to change the history and consciousness of the country’s population. However, the main ideologists of this project are outside of Montenegro. Behind this is primarily the US. Montenegro has historically been a Serbian state, but now in Montenegro brutal assimilation is carried out against Serbs. Repressive methods that can only be found elsewhere in Europe in Albania and Ukraine are used by the regime in Podgorica to strangle Serbs’ rights to free expression, prohibit the Serbian language and the Cyrillic alphabet, and wage the most serious violence against the Serbian Orthodox Church. Even though Serbs officially make up a third of the population of Montenegro, they have almost no rights. Milo Djukanovic’s main goal is to induct Montenegro into NATO. In his view, anyone who is against NATO is an enemy of Montenegro. In the recent election campaign, Djukanovic also claimed that Russia actively influenced the elections by financing part of the opposition. Any statement by Russian officials in media close to Djukanovic was considered to be interference in internal Montenegrin affairs. On the other hand, when Western officials advise and issue commands to the government and parties, in Djukanovic’s eyes this is normal. “There is no need to accelerate the process, which in itself runs very smoothly, so that, when all formalities are fulfilled, I expect quite naturally that Montenegro will become a member of NATO in the spring of 2017”. Obviously, NATO does not care what the people of Montenegro think about joining the military alliance. The West holds Milo Djukanovic in its fist. Western intelligence services know of all the dirty deeds that Djukanovic has committed. During the hearing with former prosecutor Giuseppe Scelsi, Tommaso Laraspata in 1998 said that the brother of Prime Minister Milo Djukanovic in those years was inseparable from high – ranking members of the crime clan of Konstantin Sarno. Tommaso Laraspata was a member of the clan Sacra Corona Unita. He was, according to the prosecutor’s office in Bari, a fugitive from Italian justice, who stayed with his brother Rafaele in Montenegro until October 7th 1997, when he fled back to Italy. He was arrested on January 30th, 1998. Konstantin Sarno was arrested in Italy in late May 1997, when he returned to Italy from Montenegro. This is one of the reasons why Djukanovic said that he will not be Prime Minister, but instead his close friend, Dusko Markovic, the former head of Montenegrin secret service. However, from the shadows, Djukanovic will continue to pull all the strings. Overall, the whole situation in Montenegro is bad. The security situation in Montenegro is continuously disastrous. From 1992 until today, armed clashes have killed more than 500 people. Almost 50 unsolved murders remain. All of this in a country with only 600,000 inhabitants. Formal unemployment rate is around 20%, but in reality is much higher. The average salary in Montenegro is around 490 euros, but the minimum food cost for a family of four is 805 euros. 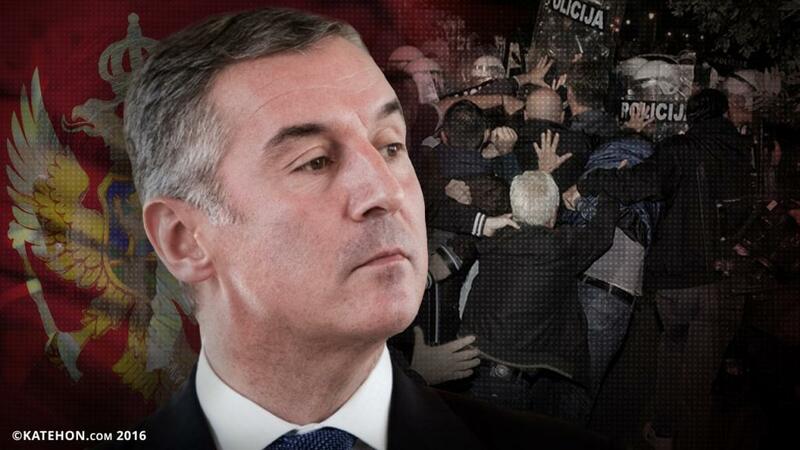 The only political entity in Montenegro that can shake Djukanovic`s dictatorship is the Democratic Front. And they are doing this. After a long time, the Montenegrin opposition has opened its doors for the Kremlin. This is what scares Djukanovic. The Montenegrin front today is the struggle for a free and better Montenegro that will not be in the chains of NATO and US. About 700 troops from seven NATO countries and ten partner countries are participating in this event.